The Intel Centrino Wireless-N 1000 is Intel’s new, power-optimized, single band 802.11b/g/n, true 1×2 MIMO Wi-Fi adapter. The Intel Centrino Wireless-N 1000 delivers double the receive throughput of 1×1 SISO products, providing true 802.11n performance. 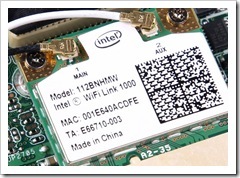 The Intel Wi-Fi Link 1000 is an IEEE 802.11b/g/Draft-N wireless network adapter that operates in the 2.4 GHz spectrum. This adapter, available in both PCIe mini card and half mini card form factors, delivers up to 300 Mbps of receive throughput. It also delivers a host of features to enhance today’s mobile lifestyle. Fanless netbooks and thin value notebooks are the primary target for this low profile, one-sided design. "Intel(R) WiFi Link 1000 BGN" ; "Intel(R) WiFi Link 1000 BG"